Jeannie loves her apartment. It has a separate bedroom, a small bathroom, and an open-plan kitchen, lounge and dining area. It’s compact, but sliding doors open onto a generous balcony to create a larger living space. Jeannie often takes her meals on the balcony, where she can sit surrounded by pot plants and enjoy a view across houses with leafy backyards. Jeannie’s three-year-old apartment is one of 57 single-bedroom units in Caggara House, a five-storey affordable housing development. It’s in a quiet street in Brisbane’s Mount Gravatt, within easy reach of shops, a medical centre, cafes and public transport. Jeannie has spent much of her life in public housing on Brisbane’s south side. She brought up her three children in a three-bedroom commission home in nearby Holland Park. Eventually, though, getting up the stairs became a problem, and Jeannie felt a bit unsafe living at ground level. At Caggara House there is a security entrance, a lift to her third-floor apartment, and wide passageways and doorways, so it is both safe and easy to navigate for someone with limited mobility. Caggara is split into two buildings with a landscaped garden in between to give the complex a “green lung”. There is a shared barbecue area, a communal laundry, and a common room for parties, meetings and exercise classes. The development has won prizes for an energy-efficient design that provides for both privacy and social interaction. 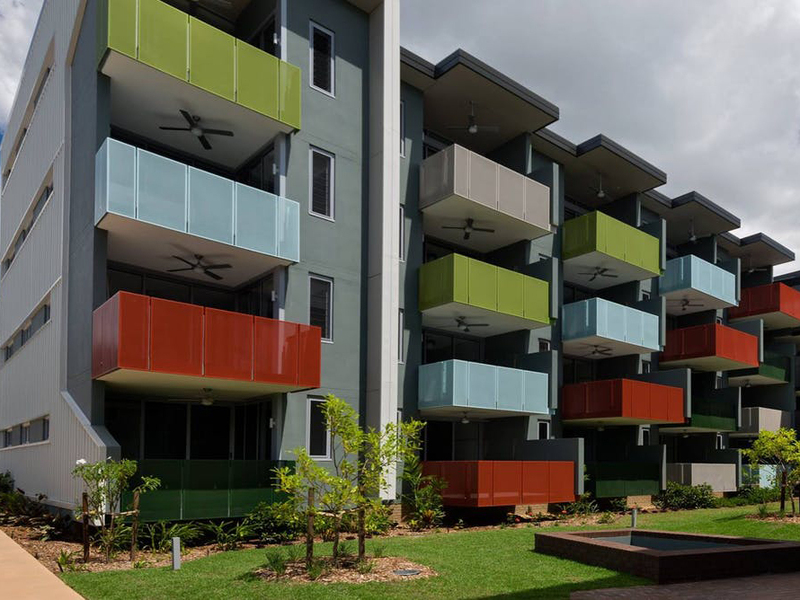 Yet the real innovation is in the concept — it provided well-located, high-quality housing for low-income residents aged 55 and over, while freeing up resources to add to Brisbane’s overall stock of affordable housing. This might sound like a magic pudding, too good to be true, but Caggara’s residents previously lived alone in state-owned houses that were too big for their needs. Those houses were worth about A$500,000 each. It cost a little more than half that much to build each of the units in Mount Gravatt. In this way, an investment of A$15 million in Caggara freed up A$25 million worth of assets that could be put to better use, either by accommodating families on the waiting list for social housing or by being sold to raise capital for new buildings. Caggara House is an initiative of the not-for-profit Brisbane Housing Company. It’s a provider of what is often called community housing, to distinguish it from the public housing supplied by state authorities (even though they serve a common client base of low-income tenants). Since it was set up in 2002, BHC has built 1,300 affordable rental dwellings and earned the same AA- credit rating as the Commonwealth Bank. Housing First (previously the Port Phillip Housing Association) is another innovative community-housing provider. It has 1,200 dwellings scattered around Melbourne. And, like BHC, it forms strategic partnerships with private developers, other community organisations, and all tiers of government to build energy-efficient homes with low running costs. In Sydney, affordable housing provider BlueCHP has a portfolio of 1,600 properties. In November 2017 it opened Macarthur Gardens, a mix of apartments clustered in three towers close to Macarthur Railway Station, Macarthur Square Shopping Centre, and Western Sydney University. BlueCHP manages 56 of the dwellings as below-market rentals for low-income households and is selling the other 45 to help finance the project. Macarthur Gardens is the largest residential complex in Australia built from cross-laminated timber. BlueCHP was the first developer in New South Wales to use this cost-effective, environmentally friendly technology. "Not-for-profits can take risks. They can work quicker and smarter." Community housing providers also “know their residents and know their geography”, Cant adds. Australia has a pressing need for more social and affordable housing. More than half of all low-income tenants in the private market spend at least 30 percent of their disposable income on rent (and often much more than that). This can lead them to skimp on essentials like food, heating, transport, health care and schoolbooks. In the long term this sort of rental stress can damage physical and mental health, stunt educational attainment, and limit opportunity. Cant thinks the best way to reduce rental stress is to build up the community housing sector, even though it currently provides less than 1 percent of all Australian dwellings. He is confident this can be done, based on 25 years working in Britain. Before the Thatcher government sold off council houses in the 1980s, local government was the largest and most established provider of low-cost rental dwellings in Britain. Today, housing associations are more significant: 170 individual housing associations own 2.49 million homes – more than 10 percent of all housing in Britain. Local government now accounts for just 7 percent. "Housing associations in the United Kingdom grew out of an ideological and political push that the state is not necessarily the best provider of housing." The view was that smaller organisations that were closer to the community could do a better job. Goldsworthy says British housing associations were able to borrow proactively, capturing a relatively small amount of public subsidy and matching it with lending from other sources. That’s exactly the sort of agility that gives community housing an edge over public-sector providers in Australia. In the 2017 federal budget, the then-treasurer, Scott Morrison, announced two measures designed to enable not-for-profit associations to build more housing: the National Housing Finance and Investment Corporation and an affordable housing bond aggregator. Together, they are designed to make it easier and cheaper for housing providers to borrow money by acting as a bridge between community-housing providers and superannuation funds. While community organisations can and do borrow from banks, each loan must be separately negotiated. Super funds won’t deal one on one with individual providers in this way, so the NHFIC aims to offer them a standardised, rated investment product. Since it has the backing of both Labor and the Greens, the NHFIC should survive any change of government. Yet the most important tool for repairing housing in Australia is still missing — a substantial amount of government money. Cant, who was recently appointed to the NHFIC board, says poor people are generally reliable rent-payers because they know housing underpins the rest of their lives. Offered a deal along the lines of “be a good neighbour, pay your rent and you can stay here as long as you like”, they will grab it with both hands and enjoy a sense of pride and ownership that is indistinguishable from an owner-occupied home. Yet the rent they can afford to pay is not enough to cover the cost of building and maintaining community housing. "If you want to house people on lower incomes then you have to find a bit of a subsidy," says Cant. The holy grail of superannuation funds investing in affordable housing will not be achieved unless government tops up the rents paid by low-income households to generate an acceptable rate of return. Australia badly needs more rental accommodation that does not leave low-income tenants living in stress. The only proven way to increase the supply of social and affordable dwellings is to increase public investment in the sector — in other words, to spend more taxpayers’ dollars. Why should wealthier Australians agree to subsidise the housing of poorer Australians through the tax system? For David Cant, social justice is reason enough. "As a nation, we are sleepwalking into inequality. The settings we have got are dividing the community," says Cant. As housing inequality worsens it will touch more and more people. One day it could be an old friend, a sibling, a child, or a parent facing housing troubles. One day it could be you or me. This is an edited extract from No Place Like Home: Repairing Australia’s Housing Crisis, published by Text on September 17.